Campaign postures on a variety of subjects have been abandoned by President Donald Trump as he closes in on his 100th day in office. Many voters still back his original positions, but when told of his new stances, a new survey by Morning Consult/POLITICO found the president’s supporters are sticking with the Trump train, even as it switches tracks. Public opinion about the Export-Import Bank provides the starkest example of this dynamic. Many voters have no opinion about the bank, which provides trade assistance to American companies. Conservative critics have vilified it as corporate welfare, but nearly 4 in 10 voters (38 percent) said they hadn’t heard of it or had no opinion about it. Another 40 percent expressed a favorable view of Ex-Im when told it “provides credit, insurance, and loans to foreign and domestic companies in an effort to promote U.S. exports,” while 21 percent expressed an unfavorable view. But when mention of Trump’s commitment to the bank — a departure from his previous stance — was thrown into the mix, many voters who previously said they said they did not have an opinion hopped on board in favor of it. After being told of Trump’s favorable comments, 53 percent of voters said they had a positive view of the bank while just 28 percent said they had no opinion. Two in 10 voters (20 percent) expressed an unfavorable view. The shift was particularly dramatic among Republicans and Trump’s supporters. Before being asked about Trump, 42 percent of those who said they voted for him expressed a favorable view of the Ex-Im Bank. When those voters were told Trump supports it, opinion shifted 24 points, to 66 percent expressing a favorable opinion. Americans who voted for Hillary Clinton in 2016, meanwhile, were less swayed by Trump’s commitment, although their favorable views of the bank rose from 44 percent to 49 percent. 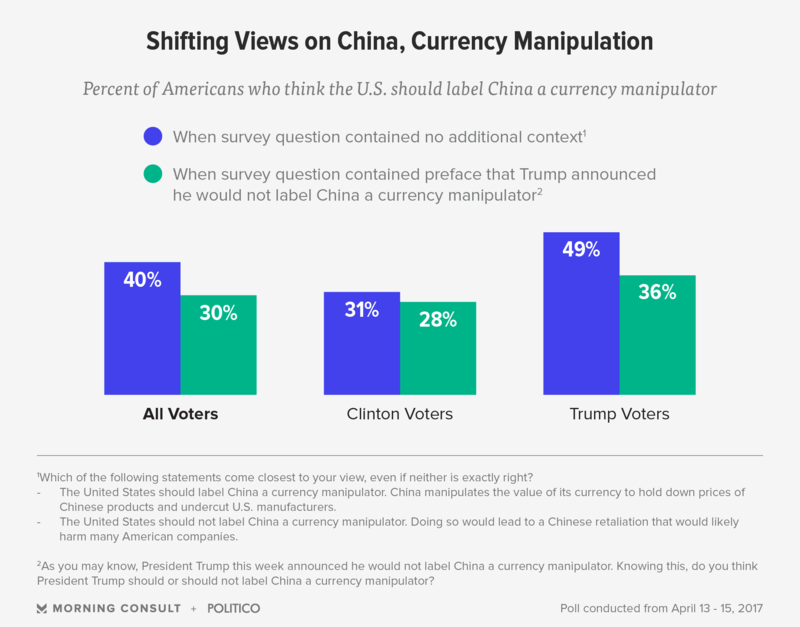 Nearly half of Trump’s voters (49 percent) said they thought China should be labeled a currency manipulator. But once they were informed of Trump’s new position, only 36 percent said he should apply the label to China, while those who said the U.S. should not rose from 22 percent to 33 percent. There was much more deviance among Clinton’s 2016 voters — about a third (31 percent) of them said China should be labeled a currency manipulator, while 42 percent said it should not. But unlike Trump’s supporters, their views hardly changed (28 percent said “should label” vs. 43 percent who said “should not label”) when told of Trump’s position on China. The national, online survey polled 1,992 registered voters April 13-15 and has a margin of error of plus or minus 2 percentage points. Update: An earlier version of this story referenced polling on the North Atlantic Treaty Organization. Due to an editing error, the poll referred to an incorrect name for NATO. That section has been removed.